I met Berit Ellingsen on Twitter, where she shares photos of her two Burmese cats, Chloe and Dotty and where she frequently talks about the beauty of video game characters. I love a good cat photo like the rest of the Internet crowd, but it’s the way Ellingsen talked about the video game world that made me ask her to tell me more. I know nothing about video games (I’m plagued with heavy duty motion sickness which makes me vomit). Still, I found myself laughing at a video she posted in which one of her avatars dances to Up All Night To Get Lucky. I wondered if I was missing out by being unable to participate in the gaming universe. Five seconds into a video game, I confirmed that, until a magic pill is invented to keep my stomach settled, five seconds is my limit. I also discovered that Ellingsen is a compelling and extraordinary writer. Her story collection, Beneath the Liquid Skin is mesmerizing. First, I must explain how I don’t usually read books like Ellingsen’s. The closest I’ve come is Alan Lightman’s Einstein’s Dreams in which there are short passages of true and fantastical renderings of the concept of time. 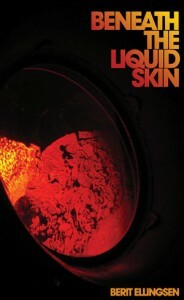 In contrast, Beneath the Liquid Skin offers a much more varied range of stories in style and content. Each story is different from the last in tone, subject matter, and point of view. Usually, I read books where reality is pretty standard, there are no truffles growing on my lover’s leg (from “The Love Decay Has for the Living”) and the laws of gravity apply (“The light swells and swells inside us until we are ready to come off the ground like scabs from the skin,” from “Sliding”) or I’m asked to accept there’s order even when there doesn’t seem to be order in this fictional world (“0 is for wholeness and emptiness at once…”). “Can you decide what to think and when?” the farmer said, and looked directly at the king. Ellingsen’s stories are like beautiful crystals, the kind that flashes prismatic colors. In them, you see yourself, you see the entirety of existence, you see how small you are and also how large. You’re acted upon by extremes of weather (“The White”), at the mercy of fate (“The Story that Tells Itself”), your own desires (“The Love Decay Has for the Living.”). She points to humankind’s impact on our planet (“Anthropocene”) and the violence we perpetrate on each other (“Sovetskoye Shampanskoye”). The ideas are grand, shocking, recriminating and redemptive. Because of the particularly deliberate way she uses language and the format of the words on the page (she uses white space in short bursts of prose in “Crane Legs,” for example), I ask her about her choice to write in English as a Korean-Norwegian woman living in Norway. She says she studied life sciences and neurosciences at the university level where all the textbooks and lab manuals were in English. It was too expensive to translate specialized materials for graduate courses. She noticed that English afforded her more range in her writing. The English words ‘lend’ and ‘borrow’ for example have only one counterpart in Norwegian. Jimin Han (@jiminhanwriter) teaches at Sarah Lawrence College’s Writing Institute and lives outside New York City with her husband and children. Her writing may be found at NPR’s “Weekend America,” The Rumpus.net, and The Good Men Project, among other places.